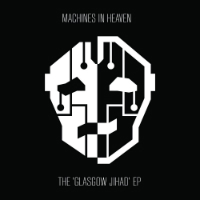 This debut EP by the Glasgow four-piece Machines In Heaven declares war in its title, begins with a national athem, and goes on to invade borders between Pop, Post-Rock, Electronic and Hip-Hop. This is a new collaboration between Graham Crossan (previously The Great I Am) and producer Magic Daddy (Optimo, Stuff, Oscarr), who took Crossen's lo-fi aestetic and transformed it into a multilatered production. While all three tracks are well worth a download, the Glasgow reviewer RaveChild describes the closing track as "the band at their most ambitious, encompassing everything from skittering RnB rhythms to a widescreen Killers-esque guitar line." Watch out for their debut album in March out on Black Lantern Music.